As well as loving crafty things, I am a qualified Early Childhood Educator, and have held the position of Director of a Kindergarten. My background made designing this project so much fun, because as well as enjoying the creative part of the process, I also know how each page helps a child to develop. I thought I’d share these points with you. Eye-hand co-ordination – is practiced by lifting, zipping, pulling, bouncing, pressing, opening and closing. Language is practiced while talking about the pages – words can be used to describe colours, teddies, and actions – “zip”, “bounce”, “open”. The rhyming story encourages storytelling and a love of books. Imagination is developed as stories about Teddy are created. The simple repetition encourages memory development, and shapes, colours and movements are learned. Social/Emotional – reading is a key activity that encourages a bond between the reader and the child. Gentle, rhythmic reading can help a child to settle after a busy day. Wholesale orders can be made through Creative Abundance . To purchase patterns for your own use, you can ask your local craft shop to order them in from Creative Abundance or you can purchase instant digital downloads from my Etsy store. The first Christmas took place in a stable. My new pattern "The Last Christmas" is a nativity set. It makes a lovely Christmas decoration, and doubles as a child-friendly playset. Each large doll measures 12.5cm(5in) high. PDF Instant downloads can be purchased from my Etsy store. Wholesale order from Creative Abundance. Welcome to the Happy House. This playset includes two dolls, their teddies, a bathroom, bedroom, kitchen and laundry. It uses machine piecing and machine and hand applique and is a perfect project for “scrap busting”. Take the socks in and out of the washer, hang them to dry, and place them in the basket. Bake a cake in the oven, then take it from the oven and put it on the cake stand. This mini quilt can be used as a countdown calendar for Easter, or you may choose for it to hold an egg for each family member. This design uses machine applique, piecing and quilting. Hoppy Easter! Posting letters is such fun! This adorable pattern has the instructions for the letter-box, the mail bag, and the fabric envelopes. The envelopes open and are secured shut with Velcro, so that little letters or drawing can be written on paper, put into the envelope, and posted into the letter-box. 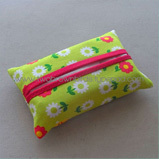 This pattern is great for using novelty fabrics, and those with small motifs in bright colours. It is best suited to those with some sewing experience. Older children may write paper notes that can be slipped into the envelopes, while younger ones may post them as they are. When complete, this play-set helps children develop fine-motor skills, eye-hand co-ordination, social play skills, language skills, and a sense of imagination, all while having fun! Eloise and Albert are off on a picnic! With their basket of carrots they’re ready for fun in the sun. These bunnies and their carrots are made from pure wool felt, with linen and cotton clothes. Helpful Henrietta is a sweet hen that loves to help you sew. Her pocket wings hold scissors and thread, her tail is perfect for holding your needles, and her body makes a great pin-cushion. Happy stitching! Lots of new designs for you! The Honeycomb pincushions pattern comes with instructions for two cute little pincushions made from quilted hexagons, a round one and a square one. This pattern uses both hand piecing and machine piecing. The sample was made using Tilda’s “Bumblebee” Collection. The “Angelsong” pattern has instruction to make these wee little angels. Their dresses are made from Broderie Anglaise lace, and the pattern includes the instructions for four different hair styles. Ginger & Mittens are ready to play in the park. While Mittens can’t wait, Ginger feels a little scared, so her security quilt should help her feel better. These kitties are made from pure wool felt, with the quilt and clothes made from cotton. All aboard the SS Scurvy! Capt’n Skinny-legs and his Pirate Posse are sailing the seven seas in search of mermaids! Everyone loves the Fun Fair – especially when there’s a Ferris Wheel! This play quilt features six little dolls that make up the Ferris Wheel family. When little fingers have finished playing with the dolls, they can be slipped into the Ferris Wheel pockets to display on the wall. Each little doll slips in and out of their pocket. Even Granny loves the Ferris Wheel! Oh I havent blogged for SOO long that I haven't let you know about my newest patterns. Here's an update! Everyone loves a camping trip! This caravan opens up to reveal a playset including two dolls, their teddies, a bathroom and bedroom. It uses machine piecing and applique, and is a perfect project for “scrap busting”! Baby and Teddy’s happy faces show that they love to play. When they’re tired, flip them over, and their face shows that they’re sleepy! Time to sing them a lullaby and slip them into bed. Polly & Pickles love to have tea parties – especially if donuts and strawberries are on the menu! This pattern shows how to make Polly, Pickles, their clothes, donuts, strawberries, teacups, plates and picnic blanket. It uses machine sewing, and the teacups use a unique hand-piecing technique. Bronson is a cheeky polar bear that’s ready to play in the snow. His body is made from wool felt, and his overalls are made from cotton. Watch out for that snowball! Click on the shamrock picture on the right hand side of the screen to take you to the free pattern. When my super talented designer friend Melly McNiece asked if I would like to use her new Teddy Bears Picnic fabric range for a new pattern design, how could I say no?! Look at the wee little mushrooms! And the bees! I couldn't go past designing a Teddy Bears Picnic playset. Meet the teddies, Billy and Pip. This fabric range is perfect for fussy-cutting. I had so much fun choosing my favourite sections to fussy-cut for the picnic blanket blocks. I've called this pattern "Picnic Time". It will be available from walk-in and online patchwork stores next week. I was so excited to have my April Showers quilt featured in the April editions of Homespun magazine. .....and what an wonderful surprise when I received my copy of the magazine, to see that my quilt was on the cover! This quilt is made up of machine pieced blocks, with the machine appliqued umbrella block in the corner. I just love this shot from the magazine with the gumboots nearby! - cute! This week I’m working on more dolly designs, as well as a few new pincushions. I cant wait to show you! No sneaky peeks today, but instead some eye candy from my garden – some gorgeous flowers that I love to grow. Hi there sewing friends. I need your help! I have a zillion ideas for future projects whizzing around in my mind, and just don't know which ones to settle on! What to do? So, I decided to ask the experts - that's you! You, dear crafty friends that enjoy my patterns. I have some pattern prize packs up for grabs too! Prize pack #1 - Five patterns; Snow White and the seven dwarves, Sleeping Owl Coin purse, Sweet Summertime quilt, Bella Bluebird pincushion, and Pretty Little pincushions. Prize pack #2 - Five patterns; Tiny Teacups quilt pattern, Miss Mind-it sewing caddy pattern, Christmas Candlelight candle mat pattern, Santa Season pattern, and Pretty Little pincushions pattern. Prize pack #3 - Five patterns; Sunday Afternoon quilt pattern, Primrose sewing helper pattern, Simply Santa pattern, Nellie's Pins pincushion pattern, and Pretty Little pincushions. So, what do you need to do to try and win a pattern prize pack? Just zip on over here to answer a few simple questions - I've made it a quick and simple as possible, I promise! This is open world-wide. I'll draw the three winners at 8pm AEDT next Sunday, the 8th of March. Good luck!